Santa & Cole, Spain, imported from Europe. Designed by Ferran Freixa in 1961. The N3 is a hanging shade highlighted by its particular use of poplar wood in splints, a material which filters and spreads the light, subtly moulding and producing an aesthetic effect with echoes of the East and nature. 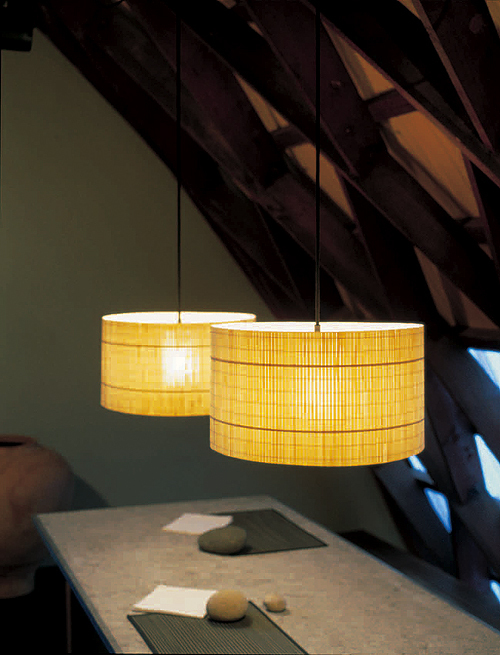 The fine strips of poplar wood are woven together to create a framework which constitutes the raw material of the shade. The lamp has a classic drum shape, reinforced by two metal circles, which projects the light not only towards the floor but also towards the ceiling. None of the material interferes with the natural aspect of this hanging lamp, because the light bulb in the interior is hidden in a plastic cylinder treated with acid which uniformly absorbs and diffuses the light. Ferran Freixa is a complete pioneer, an enterprising designer who founded the company Best-Form, of which the lamp was one of the best known productions. Poplar wood is used in the construction of this lamp. A tree that grows along river banks, poplar yields a soft, white wood with few knots which should be cut before the arrival of autumn in order to preserve its whiteness, malleability and the fineness that makes it a great diffuser of light. The Nagoya has something oriental, something Zen about it... perhaps in its treatment of light, perhaps for its subtle small pieces of wood and its natural material, perhaps for its wise combination of opacity and luminescence which doesn't produce a brilliant intensity but rather a simple clarity, which gives it an aesthetic quality. Material of shade: poplar wood. Size: 16.54" diameter x 9.45" high. Usually ships in 4-12 business days or sooner.